The role of a king is to rule. What does this mean – to rule? As co-heirs with Christ (Romans 8:17) we have a role to rule. We have been given this authority and responsibility and an example in Christ to follow. An essential approach to this is in prayer. We rule through prayer. Prayer is our discipleship school where we learn to discern God’s will and understand his purposes. 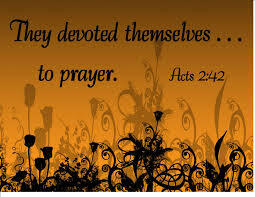 Intercessory prayer, where we are called to stand in the gap is missional prayer. 1) We ask God to open our eyes and ears to truly see the condition and issues in our community, in our nation and around our world. 2) We seek God’s face. In his presence we wrestle through the issue until we begin to gain God’s mind and heart. 3) We pray with authority, with the promises of God, drawing on the Kingdom of God values and the presence of Christ – so that that we pray the will of God. 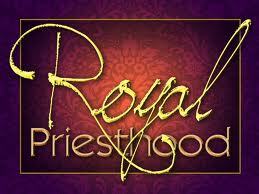 The role of a priest is to serve, to mediate, to intercede, to shepherd. 1) To have a relationship and communicate with God, our Father. 2) To express our dependence on God and learn humility as we like Jesus, do only what the Father does and calls us too. 5) To gain the insight, courage and conviction to act in opposition to the spirit of the world, recognising that there are spiritual realities to be dealt with. Since ancient times no-one has heard, no ear has perceived, no eye has seen any God besides you, who acts on behalf of those who wait for him. (Isaiah 64:4). God longs for us to engage with him in prayer, to wrestle through the issues, to cry out and seek his Kingdom to be revealed on earth. Do we really want to be agents of change, transformers? Then let us learn to pray in a life-changing missional way. 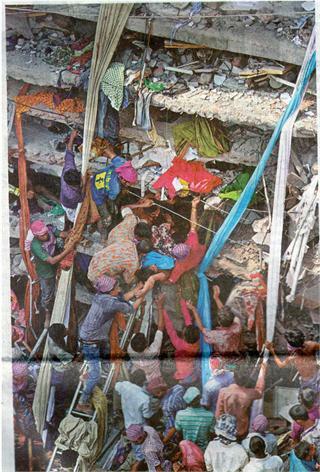 On the 24th April 2013 a garment factory building (Rana Plaza) collapsed, killing over 700 people (number still rising), injuring over 2,000 and causing devastating damage. Oh God, the cries of pain and loss rise before you. Comfort the heartbroken. The architect who designed the building in 2004 claims he was asked to design a three to four storey for a commercial shopping mall, not for industrial use and not for eight storeys. Illegal storeys were added, industrial equipment installed, overcrowding in work spaces – together all contributed to the collapse. Lord, reveal the truth and shine your light on the actions that led to this collapse so that prevention and protection of workers can be strengthened. Lord, expose injustice, exploitation and corruption and may this tragedy be a stepping stone for change. The list of construction projects plagued by corruption is growing, being seen as one of the most corrupt sectors in our world. Why? Quality of work difficult to monitor, especially as essential part underground or covered with cement. The list goes on – the outcome though remains the same: devastating loss of life! Corruption kills. The Bangladesh disaster shows us the face of corruption. Lord, show us how we can respond to this corruption? The EXPOSED: shining a light on corruption campaign is one concrete way we can all respond. Read through and sign the global call to action and make a personal pledge to walk with integrity. As we prayerfully reflect on the corruption in construction let us also stand alongside those who have ethically taking a stand. Unashamedly ethical: a campaign promoting ethics, values and clean living, inviting business to commit to accountable practices. Lord, we want to glorify you and demonstrate your character in and through all we put our hands to. Whether it be building, serving, selling, writing, planning, cleaning, growing, designing, studying, speaking, we want to be a witness to you. May we be the change we want to see. May we learn to act through not only what we say but what we do, what we buy, where we buy and how we live. The People’s Republic of Bangladesh situated in the delta and floodplains of the Ganges and Brahmaputra Rivers. It is one of the most densely populated countries in the world with just over 160 million people, drawn from 399 different ethnic (includes cultures and castes) groups. Bangladesh was part India and when colonial rule from Britain ended in 1947, it was separated out as part of Pakistan. In 1971 East Pakistan gains independence and Bangladesh is formed. Severe floods afflict Bangladesh. In 1976 the military leadership ban trade unions and in 1977 Islam is adopted in the constitution and becomes the state religion in 1998. A number of coups and changes of leadership occur. Note: politics in Bangladesh has been framed for some time between the rivalry of the first female prime minister Khaleda Zia (1991) and Sheikh Hasina (current PM). Both claim historic roles in independence struggles and constantly accuse one another, creating a hostile political environment. Economic: nearly half the population lives below the poverty line (less than $1/day). The main industries are agriculture, textiles and clothing manufacture. A key factor in the response in the garment industry to the recent collapse of the clothing factory. A significant income resource is from funds sent from Bangladeshis living and working abroad. Social: For a country struggling with poverty, overcrowding, annual flooding and frequent natural disasters, there is an amazing resilience amongst the Bangladeshi people. Significant progress has been made in advancing the Millennium Development Goals. The population size in Bangladesh is around 160 million, but there are estimated to be a further 80 million living around the world. Women have been instrumental in the success of micro credit programmes, but are still facing often undignified and inequitable treatment. Education is improving but prospects to break the cycle of poverty are low without serious action being undertaken. Good news: plastic bags are banned in Bangladesh with good success. Faith: Bangladesh was founded in 1971 as a secular state, one of four State Principles into the Constitution: Secularism, Democracy, Nationalism, Socialism. Islam became the state religion in 1988, and though officially there is freedom of religion, there has been increasing pressure exerted on the government to impose Islam into the law. Recent unrest is a clear example of this pressure build up. The Micah Challenge national coordinator is Nripen Baidya. Government: thank God for the progress made against poverty and the impact of the Millennium Development Goals have had. Pray for the government as they face the challenges of poverty, natural disasters, pressure from Islamic fundamentalists, and corruption. Pray for the new President, for wisdom and the ability to reconcile rivalries for the strengthening of the country. Economy: pray for the wisdom of those involved in job creation, industry and aid – that a well-developed approach will evolve to help raise this country out of poverty. Social: Let us particularly pray for the millions of Bangladeshi people who work outside of the country – thinking of the impact of their struggle to support families. Integral Mission: there are over 20,000 registered NGOs in Bangladesh, a massive industry. Leadership of local churches is needing much support as many need to work in various jobs to try and support families, as well as lead churches. The Millennium Development Goals have had a fantastic impact. Let us seek God’s passionate heart for Bangladesh and pray for an integrated and united response to the needs of this country. Pray especially for MNB – that their up and coming Integral Mission Conversation in October will be a great encouragement and inspiration to all who attend, strengthening one another in God’s mission here. A New Urban World: A Call to Prayer and Reflect: Tearfund invite us to join them in praying on the 8th May and each week on the issues linked to urban living. See this helpful guide here to use as a prayer framework. Great Hope Ministries, Uganda: Bishop Fred Taabu has asked us to stand with him in prayer. They have been running an orphanage over the last few years which is under threat as the owners of the building are selling it. Please pray with them for wisdom and the way ahead. Integral Mission and the Community: partnering for change: Francophone Consultation in Côte d’Ivoire from 29th July to 2nd of August. Please pray for organisers as they finalise details for this important consultation. Micah Network Staff: we ask you to stand with us as we seek ways to serve you and facilitate network meetings. Please pray for wisdom as we explore new structures. Membership: Over the last few years Micah Network has grown in the number of members and countries where members are working. We thank God for this as it is an indicator of how we are all longing to see holistic transformation in our nations. Thank God for this growing hunger and pray that we will continue.